The Con or Bust auction ends on Sunday May 3 at 4PM (I put my items up a little late…), so if you want to bid on any of the cool things over there, you have until then. 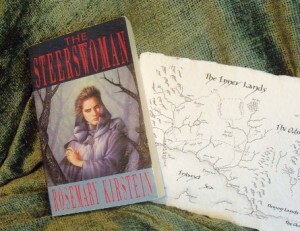 A copy of the Brit edition of The Steerswoman. 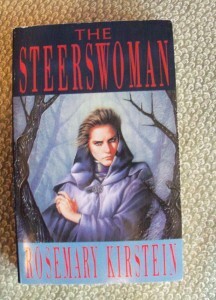 The series now only exists in ebook form, but I have in my possession a number of hard copies from its print days. This is the British edition of the first book. A nother copy of the Brit edition of The Steerswoman, but with a map of Rowan’s world, printed on handmade paper personally made by me and my personal hands. I used to make paper by hand… it was fun but messy. I haven’t done it in a while, but I still have some left from my previous production. I find that the map looks cool on the rough-surfaced, deckle-edged white paper. It’s printed on, not drawn by hand, but still looks nice. It’s the map from Volume 4, The Language of Power, so contains some spoilers! 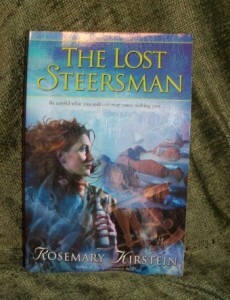 A copy of The Lost Steersman. Again, hard copies of the books are hard to find, so if you want tangible non-e books, here’s your chance. A copy of The Lost Steersman but with a little hand-bound blank journal. 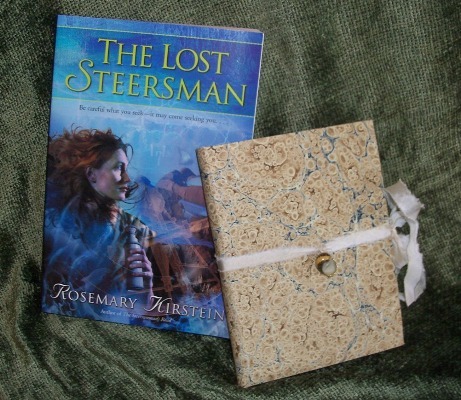 It was while I was writing The Lost Steersman that I was also experimenting with paper-making. 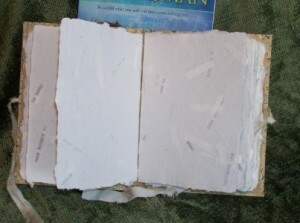 I recycled printed drafts of the book into handmade paper, and I intentionally left fragments of text visible in the finished pages, as random decorative inclusions. 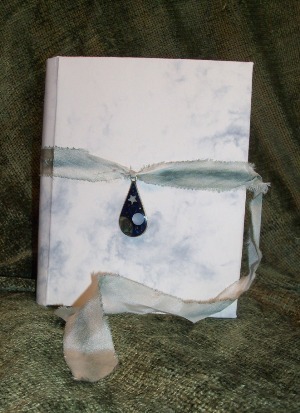 There’s a little snail on the cover, edged in gold, in honor of the Little Snails, and the ribbon tie is old silk, in honor of Alemeth. It’s a pretty thing, 20 pages. 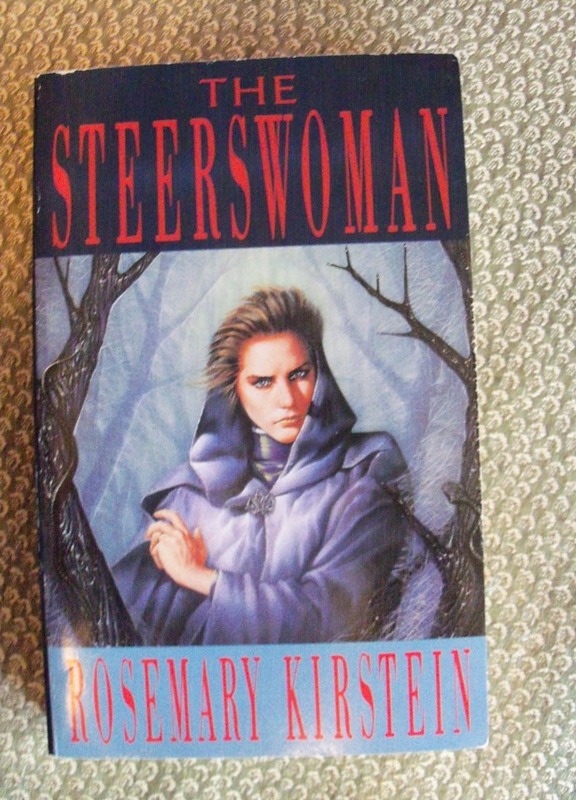 The pages are rough-surfaced, and rather stiff. They work well with colored pencil, fountain pen, dip pen, and felt tip. (Ballpoint does NOT work well!) I include a couple of loose squares of the paper, so you can experiment with your writing and drawing implements. 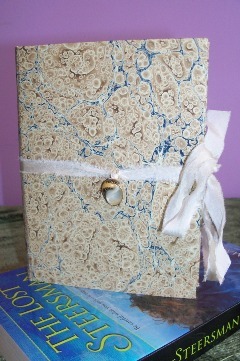 A hand-bound blank journal that I’ve decided to call “The Cloud Journal”. None of this paper is handmade… but it’s just nice. 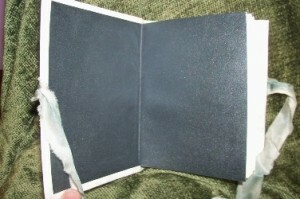 Cover is white and gray, reminiscent of clouds; end-papers are dark sliver-gray. 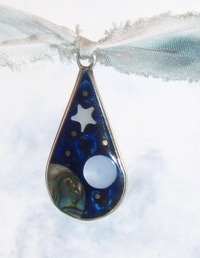 Darker than it looks in the photo — makes me think of starry nights. The internal paper is what they call “parchment” when you buy it in the art store. The embellishment on the cover was rescued from an old earring… so old that I can’t recall if it really is abalone, mother of pearl and silver. I’m pretty sure it is, but can’t swear to it. So, that’s it, five items.